Sarena Mann has worked in paper mache and other sculptural media over 30 years. After extensive studies in sculpture with independent artists and at University, she undertook an exploration of the arts and cultures of Asia. 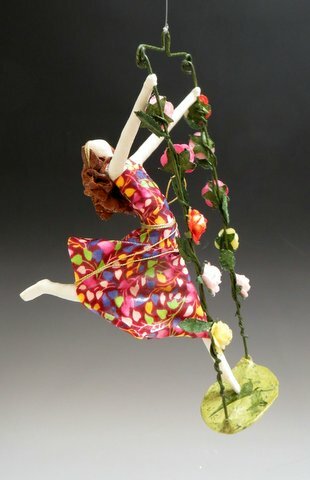 Her travels abroad provided the inspiration for Air Craft, a line of small figurative sculptures which has since expanded into a stunning array of colorful, whimsical figures and mobiles showing at fine contemporary craft galleries throughout the United States and Canada. Recently, Mann has been working on a Studio line of figurative sculptures inspired by santos and other iconic/archetypal characters, and a series of hanging tableaux. Movement, form and texture have been infused into the images Mann loves to create. “This body experience has always intrigued me.” Following the movement using the space, and changing the materials has allowed her to continue to explore the basic issues of her life. The Studio gives her the chance to play with materials, images and new ideas. The pieces will move in and out of the studio. Some will visit in other forms and some will never be seen again. Mann is having a wonderful time creating these images. She will be happy to work with you and your ideas, in hopes that you will enjoy the pieces, find they speak to you, and return to these pages to see future creations. The fun and spirit-filled flying women of Air Craft have been the mainstay of Mann’s work for 35 years. They move about with intent, freedom and spirit. In the evening they cast shadows and continue their dance. Over the years they have changed; some have retired and some have returned for a new adventure.